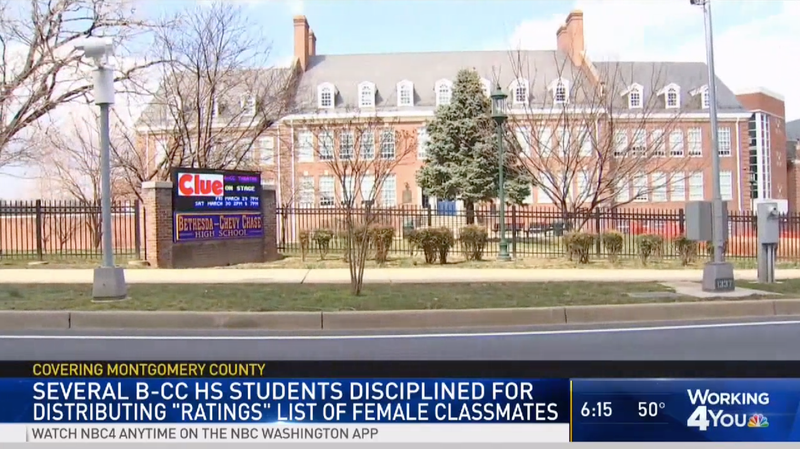 The Washington Post reports on Bethesda-Chevy Chase High School in Maryland, where a list of 18 girls ranked by their looks (with a scale of 5.5 to 9.4) was passed around at the school earlier this month. Despite the ubiquity of such lists among pimple-faced teen boys with too much time on their hands, the girls were understandably violated. In response, a two-hour meeting was held with both boys and girls in the school, where girls read speeches about being sexually objectified, some of which were directed specifically at the 18-year-old student who made the list. “It was quite intense, being so directly confronted in front of so many people for so long,” he said afterwards to the Washington Post. “When you have a culture where it’s just normal to talk about that, I guess making a list about it doesn’t seem like such a terrible thing to do, because you’re just used to discussing it...This memory is not going to leave me anytime soon.” Now the students are starting a campaign to educate younger students on toxic masculinity, with future events planned. It shouldn’t be surprising that teen girls would find a list like this disgusting, or that the list was created in the first place. What’s unfortunately surprising to me is that they’d actually do something about it and that boys, and the school, would listen. There was definitely a list like this at some point at my own high school and even as an adult I’ve long accepted that they’re just a normal part of being a teen girl. What the Maryland students did is remind people yet again that for teenagers, high school can’t be off limits for penalizing sexual harassment. In public schools girls are regularly penalized for wearing clothing deemed “distracting” but yet when boys make those same spaces distracting with their sexual harassment there is little punishment. At this point, regularly teaching young men that their female peers are human beings and not objects to rank should be a bigger part of the school curriculum.